Tell us a little bit about your journey and how you came to write this book. As an undergrad, I wanted to become the next Gloria Estefan or Selena—you know, a crossover artist singing in both English and Spanish who isn’t necessarily super popular but never really goes out of style either. That was my dream. So I went to school to study music and there I encountered InterVarsity Christian Fellowship, and I became serious about my faith. I ended up in ministry with InterVarsity, and the two passions came together—my love for music and my love for God. 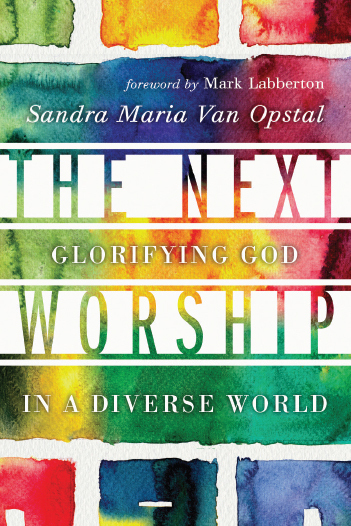 Now after twenty years in ministry, I wrote this book because I was consulting with multiethnic churches and training worship teams for national conferences, and I couldn’t find resources that engaged in the theology and practice of diverse worship. There were academic books written by missiologists and anthropologists, yet they weren’t accessible to laypeople and they focused very little on the practice of worship. How would you define worship? Are multicultural and multiethnic worship the same thing? Worship is the communal gathering of God’s people to celebrate and glorify God for his person and his actions. Worship is lifestyle, it’s obedience, it’s the way we live our Christian life. Specifically in this conversation when we talk about multicultural worship, I’m talking about that communal gathering that happens when God’s people come together and celebrate who God is and what he is doing. Regarding multicultural and multiethnic worship, I think there are some distinctions, but I often use those terms interchangeably. Multiethnic worship acknowledges, honors, and embodies the diversity of God’s global church. It’s worship that acknowledges that there are differences between us. It acknowledges that not everybody is the same, that although we are all equal and equally loved by God, we express ourselves differently. We have different sets of values, we do community differently, and we honor that difference, saying there’s something I can learn from you and I want you to be you. And then we embody that. How does your identity as a Latina affect the way you approach worship? The college fellowship I was part of was all white. It was at a school and in an area where there wasn’t really any ethnic diversity, so the practice of worship and preaching and community came out of a tradition that was pretty homogeneous. As I was growing in my faith, I didn’t understand how my own culture, my own expressions—not only my language but the way I communicate as a person—could be used in both communicating to God and in leadership. It was a journey of growing in my faith, and learning how my cultural values and norms could influence the way I worship God. What does multicultural worship look like in a setting that is culturally homogeneous? For example what does it look like for a congregation that is primarily Puerto Rican or African American? A lot of times people think multicultural worship is for diverse churches, or for people who are trying to make their churches diverse. But it has nothing to do with diverse churches, and the purpose is not to create a diverse church. The reality is that we are a global body, and as we worship God, we stand alongside our brothers and sisters in other contexts—in their pain and in their joy. We do that through the songs we sing, the prayers we pray, and the way we embody worship. Can you give us an example of what it would look like for a church to intentionally practice this approach to worship? Let me tell you about my context. Grace and Peace Community Church is in Humboldt Park on the West Side of Chicago. Our congregation is primarily Puerto Rican, but it’s also Mexican and African American. We could just say we do multiethnic worship because our congregation includes different cultures. We could draw from black gospel, songs in Spanish, rhythms that come from both Mexico and Puerto Rico. But I am talking about worship that does more than simply represent the congregation—or even what we hope our congregation becomes. I am talking about worshiping God as a truly global church. When we did a sermon series on the book of Ruth, we heard in that story the experience of two vulnerable refugee women. And when I asked the congregation, “Can you imagine what it’s like to go to a country where people might not receive you?” the answer in our black and brown church is, “Yes.” So in the Scriptures we find a basis of understanding God’s heart for the foreigner and the alien. In the midst of that sermon series we focused on World Refugee Sunday. We learned about the refugee crisis in Syria and throughout the world. We prayed for Syria. We talked about how to get involved in our own country, with our own politicians. And we invited two Syrian brothers to share their own story of being refugees in this country. They led us into a time of worship from their experience. So here is a church that doesn’t have any Syrians or refugees in it, but we found a connection to God’s heart for this group of people who are experiencing crisis right now. What are some of the biggest obstacles churches face in beginning this conversation about multicultural worship? People often do not understand that all worship is cultural. They may identify my style of worship as Latino or charismatic worship, but theirs is “normal.” So one hurdle is the assumption that my “normal” is not everybody’s normal. Another obstacle is the assumption that this conversation is just about music. It’s not. It’s about the story that is told through someone’s worship of God. When a community of people tells God, “I love you,” how do they do it and why do they do it that way? How do the lyrics of our songs come out of our particular setting? How do you respond to those who are genuinely comfortable in their own style of worship in their own cultural context? What do you say to people who say that’s the way they encounter God? My first response is, “Surprise! It’s not going to be like that forever.” In the new earth, we will come before God’s throne, worshiping him with people from every tribe, tongue, and language. It’s going to be messy. It will include sounds we’re not used to. It will be chaotic and it will be awesome. Why wouldn’t we want to be a part of that? It’s exciting! The other thing I would say is, we each need to remember that worship is not about us. It’s about the community of God coming together and glorifying God for his person and his actions. One thing we sometimes forget is that worship is both expressive and formative. Often we approach worship as the time we open up the doors and let people come as they are and express to God how much they love him. That’s great—we should do that. But we should also have parts of our worship that are formative—parts that influence us, move us, disciple us, and change us. So we enter into practices of lament when we don’t like it because it is a discipline that occupies 50 percent of the Psalms. We enter into disciplines of celebration and dancing because we need to understand that worship is not just about the mind but about the heart and the body as well. What would you say to those who agree that this is what God calls us to do, but have no idea how to begin? What kind of practical suggestions would you make? If you’re just starting on this journey, my advice is first to understand why you’re doing what you’re doing. Let’s say you don’t have a diverse congregation, and you’re thinking, “How in the world am I supposed to do this?” Remember, it’s not about the music—it’s about what you’re communicating underneath. It’s about how you’re discipling your congregation and informing them. If you understand the values underneath the practices, those values will drive the practices. So a pastor who wants to start doing multiethnic worship should begin by asking, “What do I want my congregation to know about who God is? What is missing in the discipleship of our congregation? What do we anticipate in the life of our congregation that will require us to know something about who God is?” We begin there—and that begins to form the practice. For example, we live in an extremely divided country. And unfortunately we are extremely divided and segregated in the church as well. I would love for non-black churches to begin to do things in their worship that help them understand why the black community feels the need to say, “Our lives matter.” As a pastor I need to help my congregation understand the depth of the pain our African American brothers and sisters are suffering. And when things happen that are good, we can rejoice in that same kind of exuberance. So that means I’m going to teach songs and pray prayers and find places in sermons where we can address those issues. There’s not just one way of doing it. A church that’s first generation Pan-Asian is going to do it differently than the church in rural Minnesota with mostly Scandinavian roots. But every single church, regardless of their ethnic makeup, should enter into practices of worship that are not culturally their own—as a way of standing in solidarity and mutuality with one another. What about a church or a pastor who agrees that this conversation is important, but they want to avoid tokenism? How can a church begin practicing multicultural worship in an authentic way? The answer is relationship. Say my congregation wants to sing the spiritual “Hold On.” It’s a beautiful song and we could connect it to our own hard experiences on the West Side of Chicago. But if we don’t in any way connect it to the community or the place it came from, then we are appropriating it—kind of taking it from them. But if I am connected to that community I might say, “This morning I know a lot of us are going through some things. I read the Facebook posts, I know what’s happening. So we’re going to stand with our brothers and sisters who have taught us what it means to hold on in the midst of struggle and we’re going to receive this song from them so we can worship alongside of them and even be encouraged in our own struggles.” Then it connects us to our brothers and sisters.